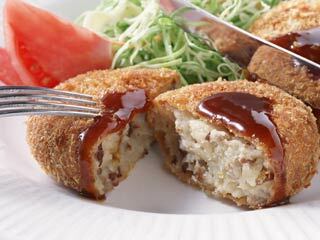 Japanese croquette is one of the most popular Japanese family dish. There are many variations, but the one with potato is the most famous. First, peel potato and boil them. Potato must be boiled from water. Make sure boil potato completely. While we are waiting for potato, grill meats and onion. First, grill minced pork and beef. Move them into a big bowl. Once, potato is fully boiled, remove them and make mashed potato. Cut little to make it easy. Just roughly, no need to completely mash them. Then add potato into the bowl. Then, add salt & pepper, one table spoon of flour, and egg yolk. Salt & pepper, one small table spoon of flour, and egg yolk. We are going to use egg albumen later. Please wait until it get cool down. First, make the ingredients into ellipse shape, then add flour, egg albumen, and bread crumb. First flour, egg albumen, then bread crumb. Add oil into a big pan and heat it. The temperature of the oil is 180c. degree. Let's check out the temperature. Looks good. Oil is ready, let's fry. Once it become this blown yellow, then finish.